There’s no dancing around the issue. There seems to be some confusion between a data-base and a network. Although they may be interrelated, they are NOT the same thing! You may have collected 200,000 names for your database but you don’t have a viable network of 200,000 people. And you certainly don’t have 200.000 friends. These people are in your data-base because you may have an opt-in list on your site or you may have purchased them from a provider or they may have used a shopping cart on your site to buy your products, books or programs and services. You may have even met some of them in-person. Because there’s a personal interaction, the people you’ve met, with whom you’ve had a face-to-face conversation, followed it up with a call or Skype face to face, a personal (not group) email or met over a cup of coffee —and then entered their data in a contact management system —are more likely to be an active part of your vibrant network. The issue remains: How do we increase those vibrant connections and personal interactions to build a viable network? The answer is both simple and complex: Learn how to work a room. It’s a vital skill for those who know how important it is expand our circles and reach out to people we need and ought to meet. It’s a matter of being social adept at mingling at events, starting conversations and circulating among a crowd. The term network implies some relationship or, at the very least, some connection. The basis of the social (and business networking) sites is that we are connected to the people we know and to those whom they know and so on and so on. The people who join my database because they opt in to my list or who follow me on Twitter.com are people who know me; but I don’t necessarily know them. Although some would argue that we have a personal connection, I believe it’s a slim one. In order to build a successful career, practice, business, downline or book sales, we also need to partake of social networking sites that provide those “medium to weak” links because it is one way to expand our networks in this internet-working world. That’s why I wrote Chapter 8 in the Silver Anniversary edition of How to Work A Room®; New Rooms To Work: The Social Media Melange. One of my dearest friends and best network connection is someone I met because of a tweet. She followed up my retweet and we’ve stayed in touch, met in person even though we live on different coasts and introduce each other to other people in our respective networks. But we have met and spent time together with other colleagues in both New York and in San Francisco. Those in-person get-togethers cemented and have expanded our friendship and connection. However, relegating all our “interacting” to online worlds via online communication and apps, is a slippery slope. We also must continue to develop and nurture our off-line networks of “real people” who know us; not just know of us. RSVP, Say “YES” and attend sponsored events. Meet and talk to people you don’t know. They may have the outlook, idea or information you need to expand your thinking. Bring enough business cards. (“I haven’t carried a card in 8 years” may be true but it’s not broadbrush thinking). Follow up with an email, text, call, and invite others to connect on linkedin within three days. Stay in touch… when you need NOTHING! We all can name the people we know who always call us so we can help them. BONUS: To Be different and memorable: GO OLD SCHOOL and Pick Up The Phone and have a conversation. Above all, go everywhere with a one unalterable goal: to have fun! And if you meet people and make it a goal to make them comfortable with you, they will want to stay in touch and do business with you and be part of your viable network of sources and resources. Bonus: You’ll have a good time in the process while you build your network. 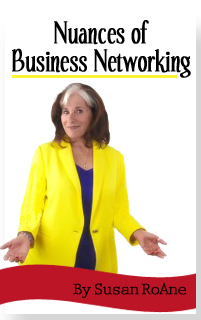 Susan RoAne is a keynote speaker, internationally-recognized expert on connecting and communicating who helped launched the networking industry. She is the author of eight books including How To Work A Room® , Face To Face: How To Reclaim The Personal Touch in A Digital World and How to Create Your Own Luck. You can follow her on twitter for timely tips and topics.